The Broad Bay personalized soccer backpack is just right for soccer practice gear. This well-made custom printed monogrammed soccer backpack or volleyball bag is well-made from strong 600 Denier Fabric. The mesh paneled interior ball compartment keeps your soccer ball or volleyball separate from the main compartment. The main section of this customized soccer bag measures approximately 10in x 13in x 9in after the ball is inside, and it still has plenty of room for your shin guards, cleats, and a change of clothes. Two zippered side pockets are great for your water bottle, keys and accessories. This top quality Broad Bay personalized soccer backpack or custom volleyball bag features adjustable padded shoulder straps, a top handle and dual zipper pulls on both the main compartment and the ball compartment. The base is 16in x 8in not including pockets. Find your bag fast with this unique personalized soccer backpack or personalized volleyball bag. A top personalized soccer gift idea for boys or girls. A TOP SOCCER GIFT IDEA for Boys or Girls! The BEST Personalized Soccer Backpack or Customized Volleyball Practice Bag for ALL Your GEAR! This Tough Personalized Soccer Backpack or Custom Volleyball Backpack Is Made with Strong 600 Denier Fabric! 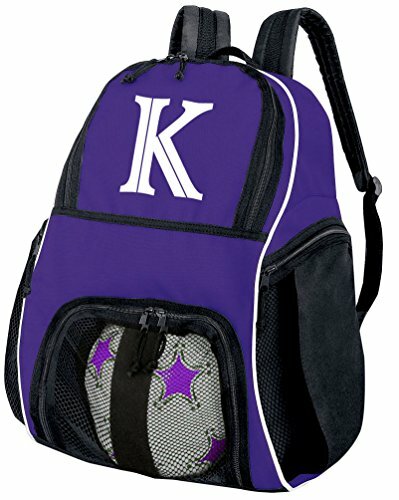 This Unique Custom Printed Monogram Soccer Bag or Volleyball Backpack Features A Separate Zippered Compartment For Ball Storage! Find Your Soccer Backpack Fast With This This Sturdy Personalized Soccer Bag - Large Main Compartment - Two Side Pockets!